The Nanea Clubhouse at the Nanea Golf Course on the Big Island became one of the winners of the 2006 Renaissance Building and Remodeling Awards. The clubhouse was designed by Group 70 International Inc. and built by Keauhou Kona Construction. 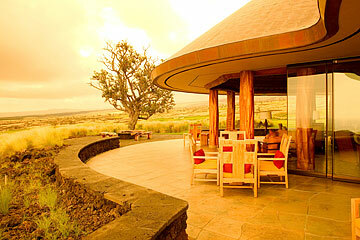 The architecture offers views that include coastline from Kona to Kohala, Mauna Loa and Maui's Haleakala. THE Building Industry Association of Hawaii presented 23 trophies last night to winners of its 2006 Renaissance Building & Remodeling Awards. Along with the trophies, these "Oscars" for local architects and contractors confer bragging rights. While there are no immediate cash prizes, an award "adds to (a winner's) portfolio for making presentations to clients, and to their credibility," said Karen Nakamura, chief executive officer of BIA-Hawaii. The enhanced portfolios and cred could bring more cash to the coffers, eventually. Of 50 entries, four Overall Grand Awards, a Carl Reppun Award and 18 Grand Awards were handed out at the Royal Hawaiian Hotel in Waikiki. » The Nanea Clubhouse, at the Nanea Golf Course at Hualalai on the Big Island, in the New Commercial Division for projects larger than 15,001 square feet.Group 70 International Inc. was the architectural firm on the project while Keauhou Kona Construction was the general contractor. The clubhouse was honored for its 360-degree views and its Hawaiian sense of place, which includes a mounded, copper-domed roof that echoes the area's hilly terrain. » Group 70 International's renovation of a bank space for its interior design and accounting departments won a Grand Overall and a Grand award in the Commercial Remodel -- Hawaii BuiltGreen divisions. The remodeling was completed with minimal structural changes and used nontoxic materials. Furnishings, floors and carpets were made from sustainable materials, and glare-reducing light fixtures, motion-detecting lighting controls, UV ray-blocking window shades and energy-efficient appliances were also used. »Welch and Weeks LLCwas awarded for its "Tree House" project in the New Residential Division in the $350,001 to $750,000 category. The home is built into a hillside and its construction preserved all the major trees on the property, including a large banyan tree within five feet of a living room lanai. The view from the home looks through the trees. » The "Bachelor Retreat" byInnerspaces andTom's Carpentrywas awarded in the Residential Remodeling Division in the $150,001 to $350,000 category. The Waikiki beachfront studio apartment, built in 1957, was remodeled from a fixer-upper to its modern state for an international banker who will spend his retirement there. State-of-the-art security, sound and electronic systems will protect the occupant and his international art collection. The Carl Reppun Award, presented to a small contracting firm, was presented toHomeworks Construction Inc., for its Hale Maluna Kai project, in the Residential Remodeling Division, more than $500,001 category. The 1970-built home was described as an abused 17-year rental. The renovation expanded its views of Hawaii Kai, Diamond Head and Maunalua Bay, blending Hawaiian and Asian design styles. The 5-bedroom, 3-bath home is now a 3-bedroom, 3-bath with a relocated kitchen that looks out onto the pool and ocean, as well as a media room. In all, awards are also presented for commercial and residential historical projects, kitchen and bath remodeling, landscaping projects and a details category. The winners also receive ink, not only in this publication, but others, including Hawaii Business and Hawaii Home + Remodeling magazines.